There’s a lot of conflicting info out there about what goes on a resume and how to structure it. So I’m going to share exactly what to put on a resume, based on my experience as a recruiter. 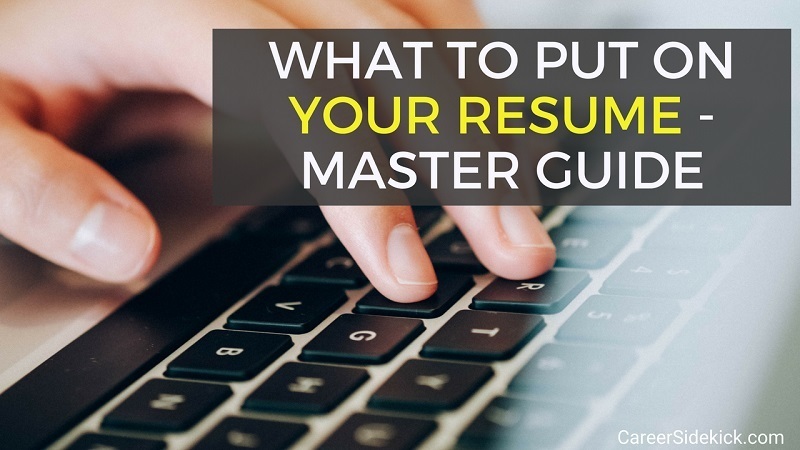 At the top of your resume, put your full name and a professional-looking email address. Your phone number and street address are optional, but for most people, I’d recommend putting it. If you’re applying for jobs out-of-state, it might make sense to leave your address off. I’d keep it simple and “clean”-looking. No distractions. Not too many fonts and colors. In fact, this is good advice for how to format your whole resume. You can add a bit more in terms of design, but don’t go overboard. This is the next section of your resume, and should go right after your name and contact info in most cases. This is a two or three sentence summary of your qualifications and accomplishments throughout your career (or throughout your education if you just graduated). Note: this is not an “objective”. I’d advise against putting an objective on your resume. Hiring managers know your objective is to land a job in their industry that will utilize your skills, etc. So put a summary paragraph instead. If you need help writing this paragraph, here’s an article filled with great resume summary examples. So it should be on the top half of the first page – visible without scrolling down. Overall, you should put it in chronological order (most recent first), and list job titles, company names, dates (you can choose to put just years, or month and year you started and ended each job – just stay consistent). And then of course, put bullets highlighting what you did in each job. I’d suggest 4-8 bullet points per job. In these bullet points, don’t just talk about job duties; talk about what you actually accomplished. There’s a big difference. 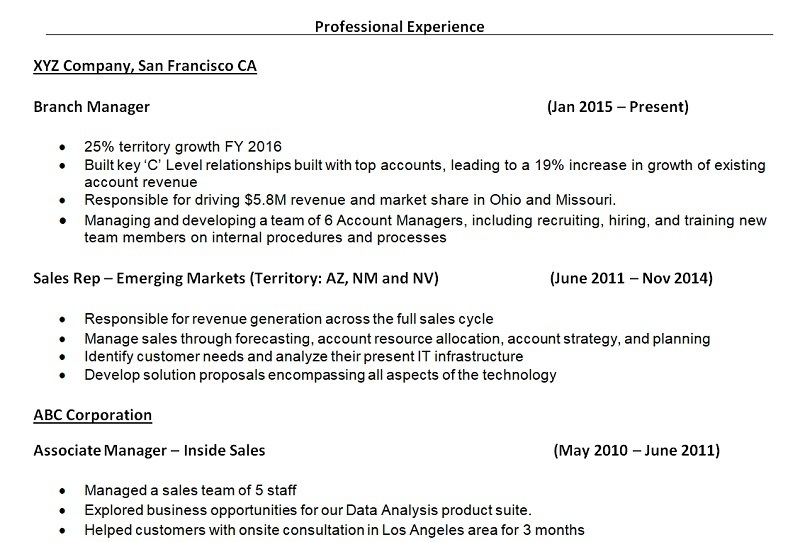 The image above is an example of a resume Employment History section with accomplishment-driven bullets. If you want more help, here’s an article with more resume employment history examples. This is the next big section to put on your resume. You might be tempted to put it before your Employment History… and people might have even told you to do this. But the only time I think it makes sense to list Skills first is if you have absolutely no work experience. Here’s why… Hiring managers don’t want to see a long list of skills without being able to see WHERE you learned/used each skill (and how recently you used them). This is why they’re much more likely to scan your resume for your Employment History section. And that’s why we put it higher up! Skills should come after that. In your Skills section, you can put a list of your top skills that are relevant to the job you’re applying for, and you can even put them under a few headers/categories if you think it makes sense for your job and industry. There’s no “magic” number of skills to put. Some people might only need 3-10; others might put 20. It really depends on how long you’ve been working and what field of work you’re in. Make sure you think about what’s relevant for the job though; don’t just list a bunch of skills that won’t help you in their job. And think about keywords too – this is a great place to put keywords on your resume so you can get past online job application systems. Put the name of your school(s), your field of study, and graduation date – unless you feel your graduation date will leave you open to age discrimination on your resume. If you graduated a long time ago, feel free to leave the dates off. You can also put your GPA in this section. I’d only recommend doing that if it was above 3.0/4. Otherwise, leave it off. You might be asked about your GPA in the first few years of your career, but you’re very unlikely to be asked about it again after that, so don’t worry if your GPA is below 3.0/4. Just exclude it from your resume. If you’ve done any volunteer work or helped in your community in other ways, this is where to put it. You can list the location, dates, and your contribution/work. If you haven’t done any volunteering or community-related work, don’t worry – just don’t put this section on your resume. Any time you’ve received awards or other recognition for your accomplishments, you should put it on your resume. If you received an award or recognition for outstanding performance at a previous job, you can list it as a bullet point or a note underneath that specific job in your Employment History section. So while awards and achievements are a great way to boost your resume overall, they don’t always need their own section. What Should Go on Your Resume if You Have No Work Experience? (Note that if you even have an internship, or a part-time job that you’ve worked while going to school, you should use the steps above! Any work experience at all is worth showing on your resume). We’re going to follow the sections outlined above, but move #5 (Education) up to #3… so it will be right below your Summary section. As mentioned earlier, you should put your full name and professional-looking email address. Your street address and phone number are optional, but for most people, it makes sense to include those too. The big exception: If you’re trying to get a job in another state. If so, consider leaving the address off. If you have no work experience, put more information in your Education section. Were you involved in any clubs/activities at school? What were some key projects you completed or coursework you did? (Specifically, key projects that related to the jobs you’re applying for now). Your resume should take up one full page, even if you have no work experience, and your Education section is a place where you want to provide additional detail to fill out the page. You can list skills that you learned in your studies, or skills you’ve developed on your own. Only put skills you’re really comfortable talking about and using, because it’s very likely they’ll ask about this in an interview. First, it’s a great way to put a lot of relevant keywords onto your resume, so that you get past computerized job application systems. Second, it’s an easy way to show employers what you know that’s going to help you succeed in their job. Always re-order and re-adjust your Skills section to fit what you think this specific employer wants! Any volunteer work or community service you’ve done. This shows employers that you’re enthusiastic and involved in the community, which can help set you apart (while also filling up your resume). If you have no work experience, these would likely be academic achievements. Go ahead and list them underneath your Education section. So don’t put this as a separate section, but do include awards, achievements and any recognition you received when you write your Education section in Step 3 above. Now that you know what to put on your resume, let’s at a few things you should leave off if you want to get interviews. If you have a long work history, considering removing some jobs that aren’t relevant, or were at the very beginning of your career (especially if you’ve been working 15-20 years or more). Note that you shouldn’t remove an irrelevant job if it’s going to leave your employment history empty. For example if you’ve only held one job but it’s not relevant to what you want to do next, you should still keep it. Why? It’s better to put a job that don’t seem closely related to your current job search, than to put nothing for your “Employment History”. And you can always show traits like leadership, accountability, hard work, problem-solving, etc., in your past work history, no matter what job you had! So hiring managers might still find it relevant and impressive. Use a Career Summary section instead, as mentioned earlier in the article. Unless you have a Ph.D. and are writing an academic CV… or unless you’ve been working for 10-15+ years… your resume should not be more than two pages. For 75-80% of people, it should really only be one page. So focus on what’s most important and keep the length short. As a recruiter, I’d rather see 8 specific skills that are relevant to the job I’m hiring for, rather than a list of 30 general skills that you’ve used throughout your career but might not be relevant to the job. So make your resume laser-focused and target their needs! You are very unlikely to get called for an interview if you have a spelling or grammar mistake on your resume – and nobody’s going to tell you either. So you need to find it yourself, or have a friend proofread it carefully for you! Here’s a little trick if you proofread it yourself: temporarily change your resume to an unusual font before proofreading. It will help you spot errors (sounds crazy, I know. But it works). I’d recommend “Tailoring” your resume to match the job description before sending it out for each job. It’ll take you a bit longer per job application, but you’ll get far more responses. Would you rather apply for 50 jobs and hear back from 1? Or apply for 25 jobs and hear back from 4? That’s the type of difference tailoring your resume can make. Here’s a full article on how to easily tailor your resume for each job. (This method will save you a ton of time). Now you know what goes on a resume and how to make each section attractive to employers. If you follow the steps above you’re going to have a great resume that grabs attention and shows recruiters and hiring managers why they should interview you immediately.